The original 325 acres purchased by Bill Hogue in 1957 was once owned by the Pottowatamie Tribe. In 1867, the US Government, by private treaty, obtained ownership from the tribe. The land was then purchased by the Atchison, Topeka and Santa Fe Railroad Company. When it was not needed for railroad access, it passed through several owners over the years. The homestead included a 2 story farm house and large barn. 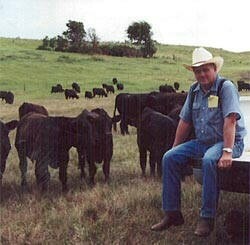 Bill built the first ranch house that year which now serves as quarters for our Herdsman. An aerial shot of the headquarters is located left. In the mid-sixties, numerous arrowheads were discovered during the spring plows when the earth was turned in the old Indian wintering grounds, an area surrounded by trees and sided by Mission Creek for a water supply. Indian artifacts are still discovered today along Mission Creek that runs through the property. A scientific dig conducted by the Kansas Historical Society in 1978 produced amazing results and recorded artifacts dating back to the Woodland and Archaic tribe era thousands of years ago. The headquarters ranch house was built in 1992. Old fashioned morning glories shade the screened in porch bringing back memories of the past when lemonade and a porch swing were sufficient evening entertainment. Over the years, additional pasture was leased to accommodate the growing herd. In 2003, an 80 acre "Bull Division" was added 1 mile north of the headquarters operation. Located there, is a bunkhouse for additional ranch hands. In the spring of 2004, the opportunity to purchase a 1,265 acre ranch in the heart of Wabaunsee County was a dream come true for Bill. He is shown at right with some of the herd. Ample Bluestem pasture, crop ground, springs and creeks, generally good fence and fantastic windbreak areas provided perfect conditions for the cattle. In 2005 another 200 acres of pasture was added at that location which is all now designated as the Flint Hills Division of Mission Valley Ranch. Several stone structures came with the land. All of them had suffered from a century of neglect. 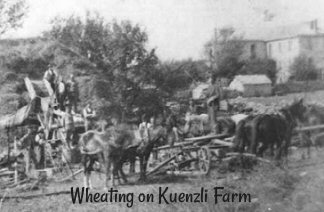 The original historic Kuenzli Family homestead had deteriorated to a point that made saving it highly questionable. The family had moved out after a 1905 fire had gutted the interior of the structure. The roof and second story were completely gone and the walls of it's landmark twin arched cellars were caving in. Giant tree roots had forced three of the exterior walls to heave thus leaving gaping cracks open to further destruction from the elements. The original homestead is pictured at left in the background of a wheat harvest scene. Bill and Kathy spent two years preserving the original homestead now known as "Stonebridge" along with a late 1800's house they call "Mission Manor" which serves as the Hogue's second home at the Flint Hills Division. 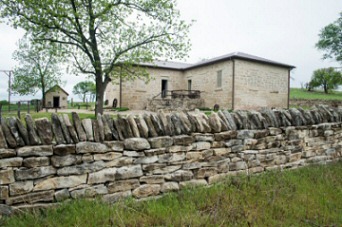 The photo at the right shows one of the rebuilt stone fences at the Kuenzli Homestead. Much of the stone had to be dug out of the earth where it had been buried for many years. The project was completed by our hard working groundskeeper. Visit Kathy’s Journal for more stone fence photos by clicking here. You can find the complete stories of all the historic structures along with several before and after photos on the Stonebridge and Mission Manor pages.